To View Trailer for: A Deeper Reality, click here. What does science think about the existence of G-d? What is the purpose of life and the world? What can I do to feel fulfilled? 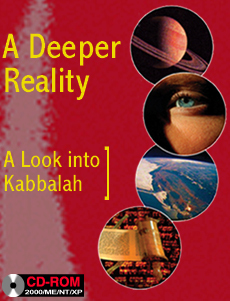 Join us for a fascinating journey - both mystical and practical - on the Kabbalah’s look into the future. From the beginning of time through our current technological revolution, take a deeper look into the energy stored in sub-atomic particles, the new global community, the future of the Internet, and where man’s intelligence is leading the world. "The Zohar, book of Kabbalah, predicted that in 1840 the wellsprings of information will open up…"
"We now have the power to destroy ourselves, what are we going to do with that power?"